Murray loves signing and playing his guitar. Join him as he serenades his friends. 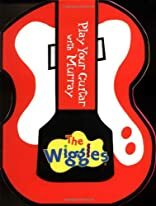 This unique board book comes shaped like a guitar, complete with a foldout neck, perfect for strumming along to the popular tunes. About Murray Cook (Editor) : Murray Cook is a published editor of children's books. A published credit of Murray Cook is The Wiggles: Play Your Guitar with Murray.